Painter, sculptor, and architect, Freddie Cabral, aka “The king of metal” has relocated from Boston, MA to Nashville, TN where he will continue to give us with the product of his tasteful industry. Cabral, who during the seventies started his career in plastic arts and architecture at the prestigious universities “Autonoma de Santo Domingo” and “APEC” in his native Dominican Republic also lived in Paris from 1980 to 1985, completing his studies on monumental arts in the Ecole Nationale Superioure des Beaux-Arts. Cabral's meticulous works, made from various metals, mud and wood as well as scraps, address the essential components or common fabric of all human beings, as well as the correlation between humans and their environment. It also links sources such as the ova and the sperm (two key elements of the biological creation during its initial phase), putting in perspective the similarities and differences of the cellular and the cosmic worlds. Opposing ways, yet concurrent. In his creative universe Cabral uses items from everyday life such as nails, cans, and bottle tops, which would most likely be discarded. He transforms them into stars, astrals or other parts of the micro world, raising their category and degree of importance. The tenuous lights that emanate and flow from the interior of his work piece produce an optical illusion of closeness and distance, and cast a special effect of displacements of all participating elements which is most effective in dim or darkened rooms. Freddie Cabral has presented 13 personal exhibits, the most recent one being “Prenumbras” (shadow cast) based on the year he spent at the University of Massachusetts in Boston as well as numerous collective expositions in different countries throughout Europe and America. Among these are France, Italy, Holland, Mexico, Cuba, Ecuador, Canada, and the sculptor’s homeland, the Dominican Republic. 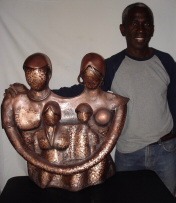 In 1992, Freddy Cabral received the “Escultura de la Bienal” prize in his native Santo Domingo and in 1978, he was awarded the “Escultura Casa de España“. His creative work has been widely depicted in books and magazines that specialize on art of the different countries of the world. “Cabral and Associates” has a workshop in Nashville, where they elaborate custom made pieces based on their clientele's ideas. Among these are murals, interior designs, metallic structures, jewelry, paintings, drawings, and sculptures in a wide array of materials. For more information, please call (615)513-8991.